Volunteers are an important part of Four Villages and help us to deliver programs that might not otherwise be possible. At this time we have limited opportunities for new volunteers. 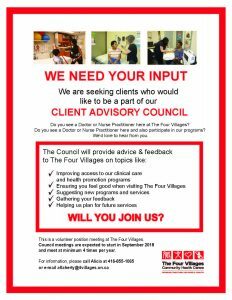 Please visit Volunteer Toronto to see current volunteer opportunities at Four Villages or to find other volunteer opportunities in your community. If you are interested in completing a student placement at Four Villages, please email us at info@4villages.on.ca. Fresh food can be a big expense for a household - don't let it go to waste with these great tips. Thanks Love Food Hate Waste - Community for the info! THANK YOU to everyone who attended our community engagement evening on March 19 in The Junction at 3030. It was great to see so many committed community members come out and share their questions and feedback including our MPP Bhutila Karpoche and a representative from Councillor Gord Perks office. snapd Bloor West was there to take some pictures!